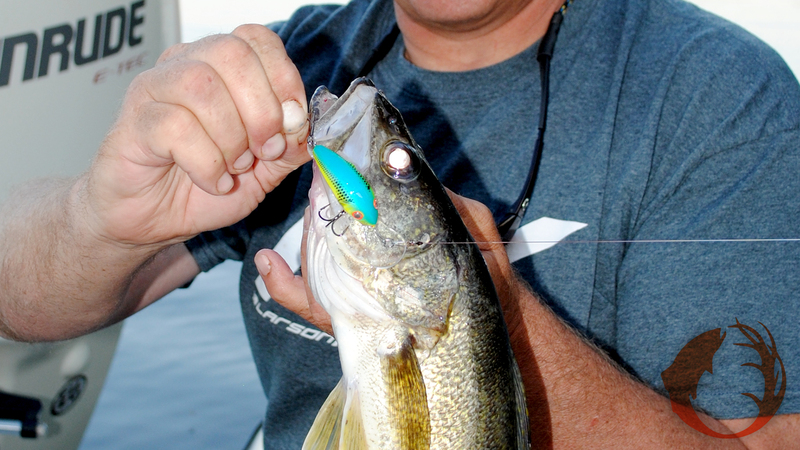 Trolling with crankbaits is a great way to catch walleyes all summer. Mike Frisch trolled this one up in mid-summer. Across the Midwest and I would guess most of North America, most game fish in most places are done spawning. After a few days of rest, those fish will get very hungry. If you can put a bait near a fish, it will probably bite that bait. The key is to show as many fish as possible your bait, and the best way to do that is by trolling. Trolling enables an angler to cover lots of water quickly and efficiently. Here’s how you can troll to catch more fish now and through the summer months. Lakes, rivers, and reservoirs are prime trolling locations. It may sound simplistic, but you need to be fishing where the fish are. From now and through the rest of the year, the predator fish will be wherever the food is. In lakes where shiners live, you’ll want to troll in areas where the shiners are spawning. In lakes where shad suspend, you’ll want to troll through and around those suspended shad. If you find their food, you’ll find walleyes, pike, bass, crappies, and whatever else swims in that body of water. Spinner rigs and crankbaits are the bait-types that many anglers troll with, especially when walleyes are the quarry. I use all of these baits when trolling, but I usually reach for a crankbait first. You can troll faster with crankbaits, so you can cover more water faster. Much of the time we’ll move the boat at one to two miles an hour with crankbaits, and about one mile an hour, maybe a tad slower with spinners. The Evinrude E-Tec 90 HO that I use runs great at trolling speeds, is quiet, and uses very little gas. When you get to a location where you think there should be fish, it’s time to get a bait in the water. Select a bait that runs at about the level that you think the fish are running at. Much of the time that will be close to the bottom. If the water is ten feet deep, use a bait that will run eight or nine feet down. If the fish are suspended, tie on a bait that will run a little higher than where you think the fish are. Selecting the bait with the proper running depth is part of the challenge in catching suspended fish. Keep trying baits with different running depths until you find the right one. Sonar is such an important tool in fishing. Modern sonar will show fish, boat speed, and all of the underwater structures that can hold fish. I’ve used several different Raymarine sonar units these past few years. Raymarine makes a sonar unit that’s appropriate for any angler, from the beginner to the expert. They draw an outstanding picture of the underwater world because the features and technology are the best. Getting multiple lines in the water is very beneficial when trolling. You can show the fish lots of different baits, which increases your chance for finding the bait they want on that day. Planer boards enable an angler to fish more lines more efficiently. Planer boards take your bait out away from the boat so a wider trolling pass is possible. If you’re fishing a two line state, and there are two of you fishing, put a line on a board out to each side of the boat, and put two lines out behind the boat. You’ll cover a wide area and you’ll get bit more often. The planer boards from Off Shore are easy to use, easy to read, and will put more fish in the boat. If you want to catch more fish, and I guess that’s the reason we go fishing, try trolling the next time you’re on the water. You might catch big fish, you’ll probably catch a variety of species of fish, but most importantly, you’ll have a good time.